A team of scientists from the Perelman School of Medicine at the University of Pennsylvania found a way to get skin to regenerate using fat cells. The human body can do many impressive things. Despite years of evolution honing its capability to carry out the complicated mechanisms needed to ensure our survival, the body has not refined the process of healing skin. Sure, wounds inflicted on the body’s largest organ can heal, but we are left with scar tissue. A team of scientists from the Perelman School of Medicine at the University of Pennsylvania however, believe they have found a way to do the previously impossible – allow skin to regenerate using fat cells. Adipocytes, the type of skin that regenerates after we get superficial cuts, is filled with fat cells that allow it to blend easily to the rest of your skin as it heals. Scar tissue (made up cells called myofibroblasts), which occurs as our skin heals from deep cuts, looks very different because it contains no fat cells or hair follicles. “The findings show we have a window of opportunity after wounding to influence the tissue to regenerate rather than scar,” said the study’s lead author Maksim Plikus, PhD, an assistant professor of Developmental and Cell Biology at the University of California, Irvine. While the discovery is indeed impressive, it should be noted that the experiment is still in its early stages and serves only to demonstrate proof of concept. Currently the process has only been proven to work in mice and human skin samples. Achieving hair follicle growth in a wound attached to a living human might prove to be more difficult. But should science find a way to do this, we may not have to worry about wounds leaving scars ever again. Outside of obvious applications to prevent scarring, adipocyte loss is also a known side-effect of other medical conditions, including HIV treatments. The aging process leads to natural loss of these cells as well, which causes permanent wrinkling of the skin. These findings could pave the way for a safer, and possibly permanent, way to address these cosmetic concerns. “Researchers have grown part of an eye in a lab dish, using a type of stem cell made from a piece of skin. Earlier this month scientists successfully created a functioning human retina using iPSCs (induced pluripotent stem cells). But that’s not the cool part. What’s actually amazing is that they did very little to make this happen. The study, published in Proceedings of the National Academy of Sciences, identified the distress signal – HMGB1. The authors believe it can be used to put “a megaphone in the system” to improve the treatment of injuries such as burns and leg ulcers. BBC News – Chemical found which ‘makes bone marrow repair skin’. Dr. Andras Nagy’s laboratory at the Samuel Lunenfeld Research Institute of Mount Sinai Hospital and Dr. Timo Otonkoski’s laboratory at Biomedicum Stem Cell Center, University of Helsinki, as well as collaborators in Europe and Canada have identified genetic abnormalities associated with reprogramming adult cells to induced pluripotent stem (iPS) cells. The findings give researchers new insights into the reprogramming process, and will help make future applications of stem cell creation and subsequent use safer. The team showed that the reprogramming process for generating iPS cells (i.e., cells that can then be ‘coaxed’ to become a variety of cell types for use in regenerative medicine) is associated with inherent DNA damage. This damage is detected in the form of genetic rearrangements and ‘copy number variations,’ which are alterations of DNA in which a region of the genome is either deleted or amplified on certain chromosomes. The variability may either be inherited, or caused by de novo mutation. “Our analysis shows that these genetic changes are a result of the reprogramming process itself, which raises the concern that the resultant cell lines are mutant or defective,” said Dr. Nagy, a Senior Investigator at the Lunenfeld. “Our study also highlights the need for rigorous characterization of generated iPS lines, especially since several groups are currently trying to enhance reprogramming efficiency,” said Dr. Samer Hussein, a McEwen post-doctoral scientist who initiated these studies with Dr. Otonkoski, before completing them with Dr. Nagy. The researchers used a molecular technique called single nucleotide polymorphism (SNP) analysis to study stem cell lines, and specifically to compare the number of copy number variations in both early and intermediate-stage human iPS cells with their respective parental, originating cells. “However, some of the mutations are beneficial for the cells and they may survive during continued growth,” said Dr. Otonkoski, Director and Senior Scientist at the Biomedicum Stem Cell Center. Stem cells have been widely touted as a source of great hope for use in regenerative medicine, as well as in the development of new drugs to prevent and treat illnesses including Parkinson’s disease, spinal cord injury and macular degeneration. But techniques for generating these uniquely malleable cells have also opened a Pandora’s Box of concerns and ethical quandaries. Health Canada, the U.S. Food and Drug Administration and the European Union consider stem cells to be drugs under federal legislation, and as such, subject to the same regulations. “Our results suggest that whole genome analysis should be included as part of quality control of iPS cell lines to ensure that these cells are genetically normal after the reprogramming process, and then use them for disease studies and/or clinical applications,” said Dr. Nagy. “Rapid development of the technologies in genome-wide analyses will make this more feasible in the future,” said Dr. Otonkoski. “In addition, there is a need to further explore if other methods might mitigate the amount of DNA damage generated during the generation of stem cells,” both investigators agreed. The University of Minnesota said Wednesday that its researchers have successfully repaired damaged skin tissue using stem cells gleaned from bone marrow. Nate Liao in 2007, then 18 months old, has his bandages changed by his mother Theresa at the hospital in Minneapolis. 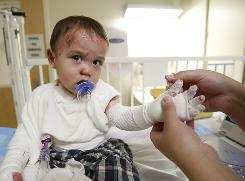 Nate was born with a genetic condition called epidermolysis bullosa. via University of Minnesota doctors use stem cells to regrow skin « MedCity News. What are iPSc? iPSc are INDUCED PLURIPOTENT STEM CELLS. In short, a scientist takes a skin cell, typically from the foreskin or testes, and regresses or devolves them into an embryonic-like stem cell (sort of like a test tube version of Benjamin Button). Now, here’s the kicker. After 2 years, extensive research based on the originally ground breaking article and a huge media following (over 4,000,000 hits on google), it turns out that not only DO iPSc form cysts/tumors…but they also may NOT be pluripotent at all. Is this a witch hunt on Skutella? Is this a fraud perpetrated by him? Is this just a misunderstanding? It remains to be seen but as a pivitol paper that has launched (or may end) an entire field of research and commercial treatment potential, a certain degree of data transparency should be expected. Data analysis ignites public row. Long-rumbling hostilities between stem-cell researchers in Germany exploded into a blazing public row last week, after Nature published a critical reanalysis of data from a high-profile 2008 article. The researchers behind the original work1, led by Thomas Skutella of the University of Tübingen, reported using cells from adult human testes to create pluripotent stem cells with similar properties to embryonic stem cells. Unlike other adult cells, these reproductive or ‘germline’ stem cells can be reprogrammed for pluripotency without the need to introduce additional genes, a step that often relies on a virus. That could make them safer for future use in medicine. The paper made headlines because such pluripotent stem cells might be used instead of ethically sensitive human embryonic tissue. Soon after its publication, however, some stem-cell scientists said that the evidence for pluripotency was unconvincing. They also complained that Skutella would not distribute cells to other labs for verification, even though Nature requires its authors to share all published research resources. Hans Schöler, a director at the Max Planck Institute for Molecular Biomedicine in Münster and an author of last week’s critical comment2, says that he proclaimed Skutella’s achievement as a breakthrough when he first saw the data at a meeting, but became doubtful after seeing the published paper. “If this paper is wrong, then a lot of scientists are wasting time, energy and money in trying to follow up on it,” he says. Others fear that the episode is undermining the credibility of the field. In response, Skutella last week asked the DFG, Germany’s main research-funding agency, to conduct an investigation both of his paper in Nature and of what he claims is a witch-hunt against him. Schöler, who also works with germline stem cells, says that he would welcome such a move. Pluripotent cells should form teratomas (often cancerous cysts) — encapsulated tumours comprising different cell types — when injected under the skin of mice, and also exhibit a particular profile of gene expression. “The teratoma pictures in the Nature paper were not terribly convincing but that didn’t concern me too much at first,” says Schöler. “It was the failure to provide cells that started to concern me.” After more than a year of requests for access, he decided to reanalyse data in the paper in Nature showing which genes in the disputed cells were being expressed. Together with bioinformaticians, he compared the genes’ expression profile with those of other cells in public databases and found that it overlapped with a type of connective-tissue cell called fibroblasts but not with pluripotent stem cells. Schöler suggests that fibroblasts may have contaminated Skutella’s samples. But Skutella and his colleagues deny3 mistaking fibroblasts for pluripotent cells. Skutella says that comparison of gene-expression data is meaningless “if the cells being compared were not processed identically”. Takashi Shinohara at Kyoto University in Japan, whose team in 2004 generated the first pluripotent germline stem cells from mice, shares Schöler’s concerns about the expression data. He says that fibroblasts and pluripotent cells have different gene-expression profiles even if the cells are not processed in similar ways, and adds that it would be helpful to see Skutella’s cells. Ulrike Beisiegel, ombudsman for the DFG, says her office will decide “soon” whether to take up the investigations. Conrad, S. et al. Nature 456, 344-349 (2008). Ko, K. et al. Nature doi:10.1038/nature09089 (2010). Conrad, S. et al. Nature doi:10.1038/nature09090 (2010). via Stem-cell furore erupts : Nature News. “Embryonic” and “senescent” aren’t supposed to go together any more than “good” and “grief” or other oxymorons, which is why biologist Robert Lanza was “devastated” when he saw what was happening with the human stem cells he and colleagues were trying to grow. Like hundreds of other stem-cell scientists, they had been intrigued and energized by the 2007 discovery that adult cells can be regressed back to an embryonic state simply by inserting four genes into them. The discovery, by scientists at Kyoto University and the University of Wisconsin-Madison, seemed to promise a way out of the bitter debates over embryonic-stem-cell research: rather than using human embryos as a source of stem cells, produce them from adult cells. Like cells from days-old embryos, the resulting induced pluripotent stem (iPS) cells have the ability to differentiate into any of 220 kinds of human cells, from neurons to retinal cells to pancreatic cells. Their promise was so great that when President Obama announced last March that he was lifting the ban on the use of federal money for research on human embryonic stem cells, critics on the right were apoplectic: iPS cells, they said, made such a move scientifically unjustified. Even President George W. Bush’s bioethics council cited the promise of iPS cells in chastising Obama). via Why Adult Cells Won’t End the Stem-Cell Wars – Newsweek.com. Let’s be clear. Induced pluripotent stem cells are derived from adult cells. Adult cells are cells from a human that is not an embryo. They include virtually any cells, but they DO NOT include stem cells. For example; one of the best sources of skin cells used to generate induced pluripotent stem cells are those skin cells taken from the foreskin of a non-embryo. Put another way; adult cells (including adult skin cells), as well as the induced pluripotent stem cells that may be generated from adult skin cells are NOT ADULT STEM CELLS. INDUCED PLURIPOTANT STEM CELLS have problems (suicide triggers) – as detailed in this article. EMBRYONIC STEM CELLS have problems (they cause tumors, have a proven failure to treat and are immersed in controversy) – as detailed in thousands of articles and trials and studies. ADULT STEM CELLS on the other hand (also called REPAIR stem cells), have a proven history of safety and efficacy (meaning they work). They do not have suicide triggers, do not generate tumors, they do not have the controversy or failure record. ADULT or REPAIR STEM CELLS have been treating patients around the world for half a decade (40 years if you include stem cell rich bone marrow transplants). Scientists have, for the first time, produced liver cells from adult stem cells using technology called iPSC, or induced pluripotent stem cell. The liver cells were created by manipulating the skin cells to resemble embryonic stem cells, which have the ability to become different cells within the body. The study, led by the University of Edinburgh’s Medical Research Council Centre for Regenerative Medicine, makes possible the creation of a liver cell library, which could revolutionise the development of drugs, making them more efficient and safe. via University of Edinburgh study paves way for stem cell library » The Journal. via Two Proteins Enable Skin Cells To Regenerate. That is why it is so sad to see them placing all of their hope on embryonic stem cell research. Stem Cell Research Enhancement Act Relating to Diabetes.